Emmy Mom--One Day at a Time: It's December! The weather is cooler (in the 60's); there's magic in the air; and our tree is up! The last several years we have just decorated the upper part of the tree. Pretty sparkly balls are too big of a temptation for little hands. But this year everyone could help. Unfortunately, our tree stand was not working and it took Eric a bit to fix it. In her impatience Alex started to get some decorations out herself, including one of my large blown-glass balls. Word of advice, do not drop blown-glass balls onto tile floor; they literally explode. It was loud, glass shattered at least ten feet each direction, but luckily no one got hurt. In the end it all worked out and our tree was up and ready, with the lower branches more than heavily decorated. Oh my goodness! These were so wonderful! Great photos...made me feel like I didn't miss it. Oh how fun! Just more motivation for me to get things done today! Thank you! And I love the attention to detail your children have. Making sure no branch is left visible! So stinking darling! my kids want to do the tree so bad but Im not ready yet... Maybe today. Looks great! And how sweet that the kids were able to help out. I need to hurry my stuff along. Before I know it'll be January! Your 10 things post is beautiful BTW - love the picnic picture. Can you believe it's December already?! I looked at my tree this morning and it seems really strange to have it up again. I can't believe the ball exploded. Yikes! Despite that, it's fun to have helpers. How lovely! No tree up at our house yet. We wait until the last minute to protect the decorations from our youngest. Yikes! Try it with three cats. I think they are worse than kids. They love to climb inside it. I love the lower branches. They are perfect. Indeed tile and glass do not get along well at all. The outfit fits her perfectly and here I was worried it would be big on her. Hahaha. Great pics. I will be sharing mine soon. 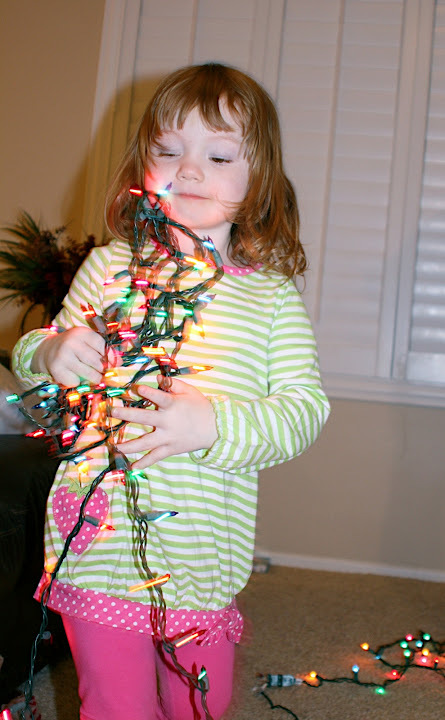 I love when you can tell a child help decorate the tree!!! 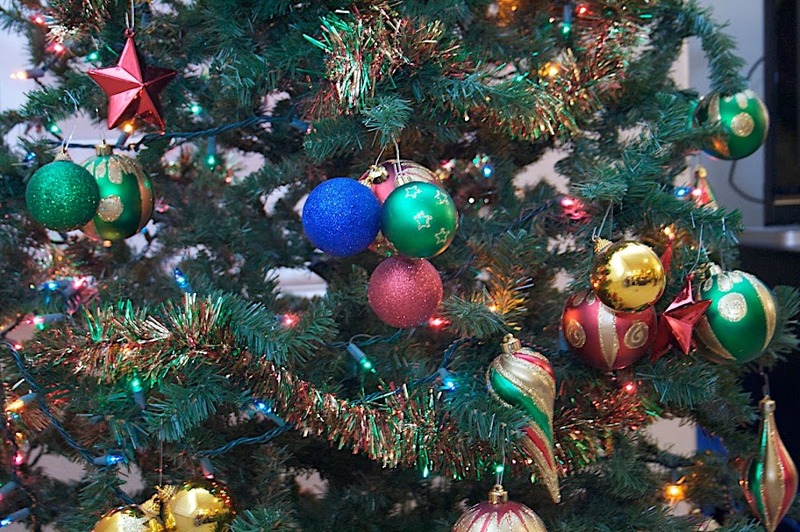 THree or more ornaments are hooked onto the exact same branch!!! Love it!! 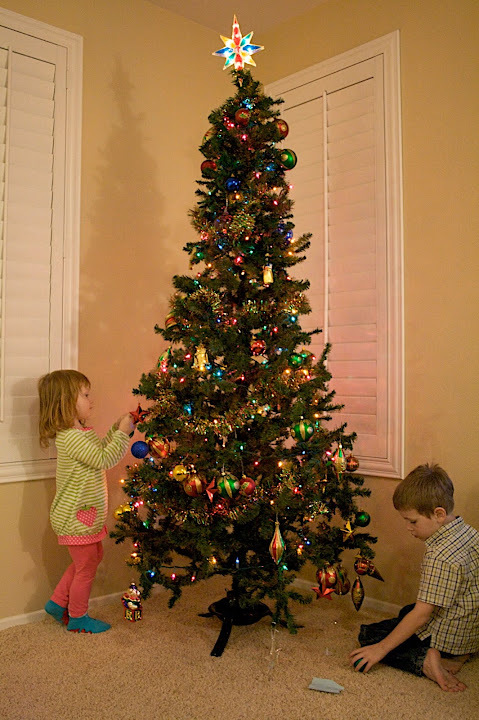 The tree looks great and your kids are too cute. I got my tree up yesterday, but not decorated yet. Will tackle this today and maybe post a pic up too! The bottom half of our tree gets redecorated on a daily basis! How fun! 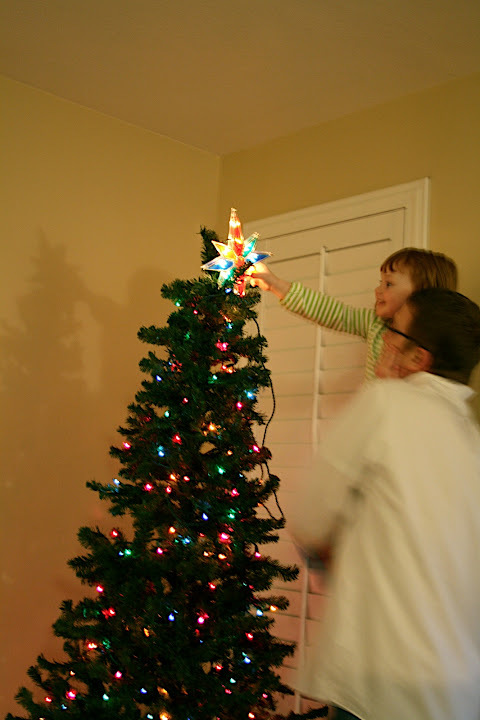 My kids want us to get our tree up, but we're going into the mountains to find one (hopefully this weekend).